The Cerebellum it is to be considered to be an absolute machine in the back of the brain. The Cerebellum is one of the most impressive parts of the human brain and it has been underestimated by scientists till now. 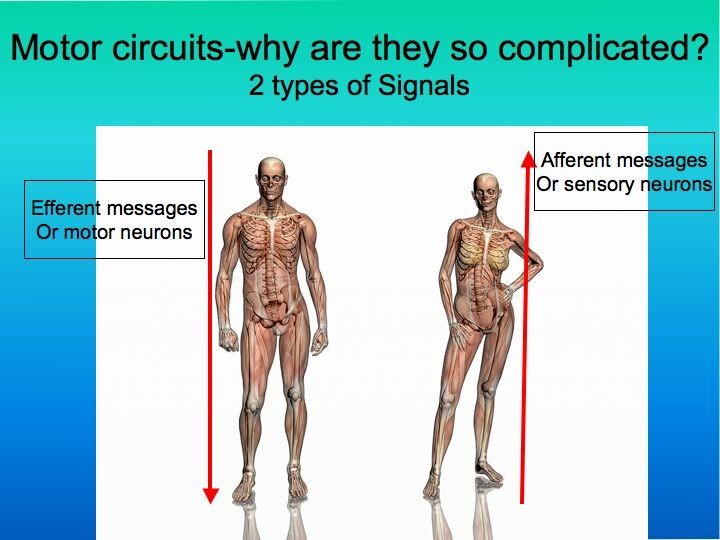 In my book Super Body, Super Brain I explain how this part of the brain can be key to unlock on the most important human quests that is how the brain interacts with the body. 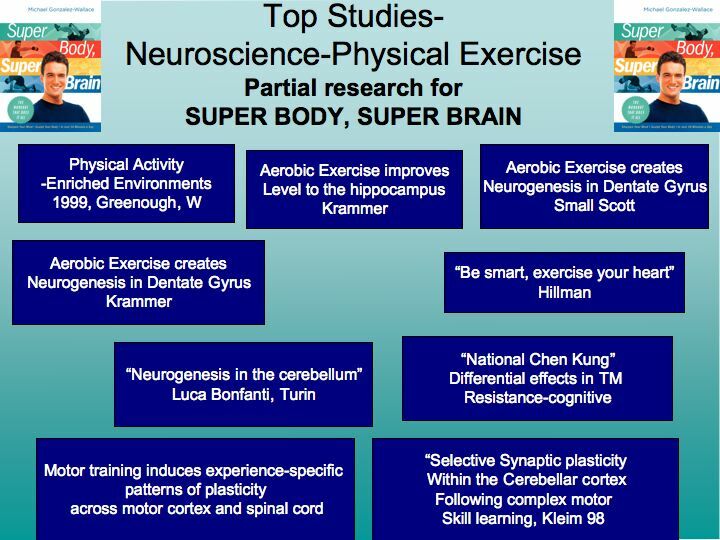 Evidence is mounting showing how this structure it is absolute key for our health, aging even our intelligence! Did you know that our brain has 100 billion neurons and 50% of them are packed in just 10% of the brain mass? Do you know where are they packed? In the bottom of the brain in a part of the brain called the cerebellum. If you are really good at math you will realize how 50% of your neurons are located in just 10% of your brain mass. However neurons in the Cerebellum are really different from the neurons in the rest of the brain. My absolute mentor Dr John H. Martin Ph.D and Author of Neuroanatomy: Text and Atlas has explained me how this interesting motor circuits work and how the cerebellum plays a fundamental role. The cerebellum (Latin for little brain) is a region of the brain that plays an important role in movement. It is also involved in some cognitive functions such as attention and language, and probably in some emotional functions but it is its function in movement that is most clearly researched. 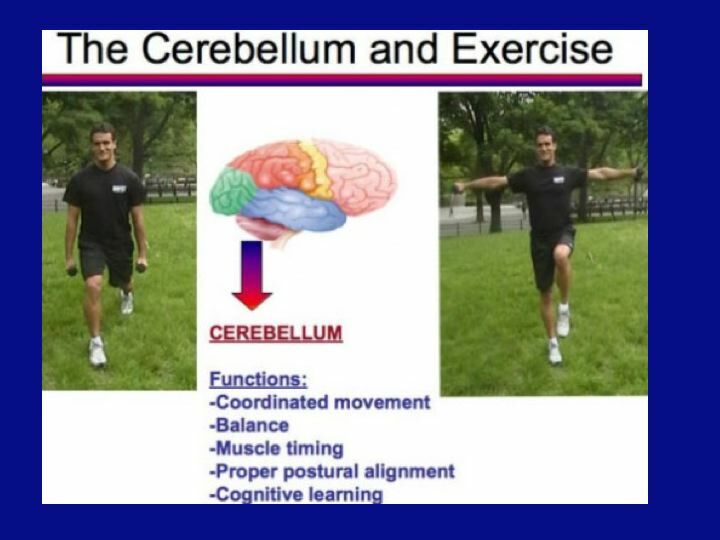 The cerebellum does not initiate movement, but it contributes to coordination, precision, and muscle timing. It receives input from sensory systems and from other parts of the brain and spinal cord. in addition other functions involve equilibrium, posture alignment and execution. The Cerebellum is responsible not just for planning and intent, but also for making sure that whatever we have planned and intended to do match! I know it is easy to say but the process in the brain it is extremely complicated. The Cerebellum receives information form the sensory systems—the somatic sensory system as well as the other major senses and cortical control centers. How is that related to muscle movement? 1. From a standing position raise left leg and clap overhead for twenty times then change legs. Then close one eye, change eyes, close both. 3. Lunges with balance and Shoulder lateral raise. Lunge position raise arms and left leg simultaneously. Do it ten times then change legs. Write down the experiences after doing these exercises. was wondering your situation; many of us have developed some nice methods and we are looking to swap methods with other folks, be sure to shoot me an e-mail if interested. this blog’s post to be updated on a regular basis. It carries fastidious data. hola es muy bueno la publicacion!!! soy FABIANA CMPIONE Y HCE 5 AÑOS FUI OPERADA DE UN EPENDIMOM INTERMEDULAR A LA ALTURA DE LA PRIMERA DORSAL Y QEDE CON UNA SECUELA DE MUCHO DOLORNEUROPATICO Y CAMINAR MAS CORTO ,VEJIGA ACELERADA MUCHO DOLOR DE COLUMNA Y SIRINGOMELIA A LO LARGO DE TOD LA COLUMNA..USTED PODRIA ACONSEJARME ALGO MAS NOVEDOSO QUE LAMEDICACION PREGABALINA?? E IBUPROFENO? ?…MIL GRACIAS!! Hey there! Someone in myy Facebook group shared this site with us so I came too check it out.